He is said to have been born to relatively affluent Christian parents in Patara , of the Roman Empire, where he also received his early schooling. He came to Myra to continue his studies. A paternal uncle of his introduced him to the local bishop. The later is said to have seen potential to the youth and took Nicholas under his patronage. Nicholas received his ordination as a priest at an early age. When his parents died Nicholas still received his inheritance but is said to have given it away in charity. His reputation for gift giving comes partly from a story of three young women who were too poor to afford a dowry for their marriages: as each reached a marriageable age, Nicholas surreptitiously threw a bag of gold into the house at night. Some versions of the legend say that the girls' father, trying to discover their benefactor, kept watch on the third occasion, but Nicholas dropped the third bag down the chimney instead. When the father found out the truth, Nicholas begged him to keep the secret, but, of course, the news got out. 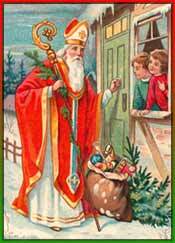 After he died, people in the region continued to give to the poor anonymously, and such gifts were still often attributed to St. Nicholas. Among the Greeks and Italians he is a favorite of sailors, fishermen, ships and sailing. As such he has become over time the patron saint of several cities maintaining harbors. In centuries of Greek folklore, Nicholas was seen as "The Lord of the Sea". In modern Greece, he is still easily among the most recognizable saints and December 6 finds many cities celebrating their patron saint. In addition, he is celebrated as a great gift-giver in several Western European countries. The Russian Emperor Vladimir visited Constantinople and heard all the wonderful stories about Bishop Nicholas and decided to make him the patron saint of Russia. The stories even spread to the Laplands - to the people of the reindeer sleds.